I was asked to join the editorial team as a features writer for the U.S. imprint of this Paris-based magazine that acts as a style barometer and unconventional pathfinder in the fashion, lifestyle and creative spheres. Working closely with the Features Editor, I was responsible for pitching story ideas and executing interviews with filmmakers, artists and musicians representing the global stage. In addition, I acted as a London and New York correspondent for the Jalouse Paris headquarters. “Would you like something to drink?” Nicolas Godin asks. We’re sitting in the lobby of the SoHo Grand Hotel, and before I can respond, he pops open a bottle of Moét (“It’s on the record label”). This begins my reintroduction to Air. With their post Beatles haircuts, spiked Seventies shirt collars, and air of medium cool, Nicolas Godin and Jean Benoit Dunckel blend seamlessly with the hotel’s svelte, if somewhat noisy, downtown crowd. I first met the quixotic up-and-comers four years ago, during the frenzy surrounding their debut album, Moon Safari, a laid-back love poem that restored melody to–and changed the entire perception of–‘90s electronic music. Though still virtuosic man-children, there’s something more polished and reserved in the Air manner this time around. 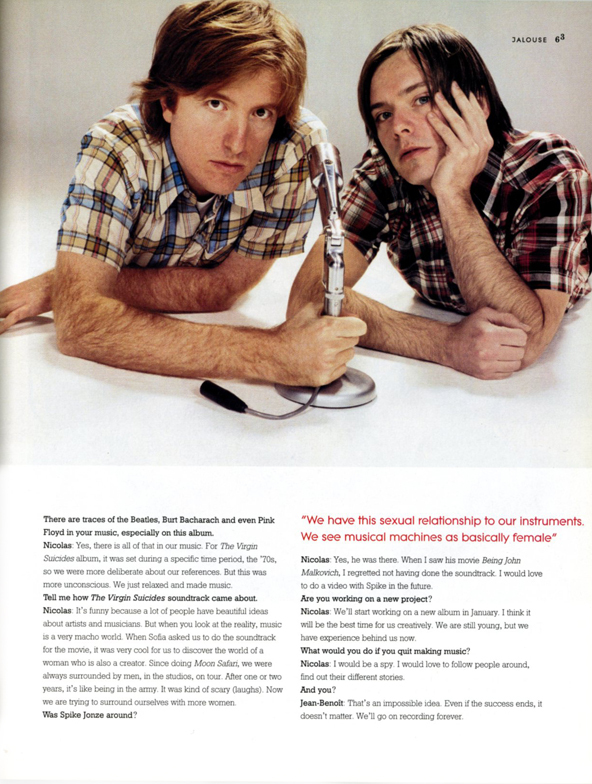 Sure, they had the success of 1998’s Moon Safari, 1999’s Premiers Symptoms and the critically acclaimed soundtrack for Sofia Coppola’s film The Virgin Suicides, released in 2000, under their 32-inch belts. But had fame gone to their Air heads? Hardly. Witty and urbane, Nicolas and Jean Benoit are still pure in their intent to create personal, intimate, electronic music with a catchy pop sensibility. The new album, 10,000 Hz Legend, blends the melodic splendor of Moon Safari with a darker, more psychedelic mood. 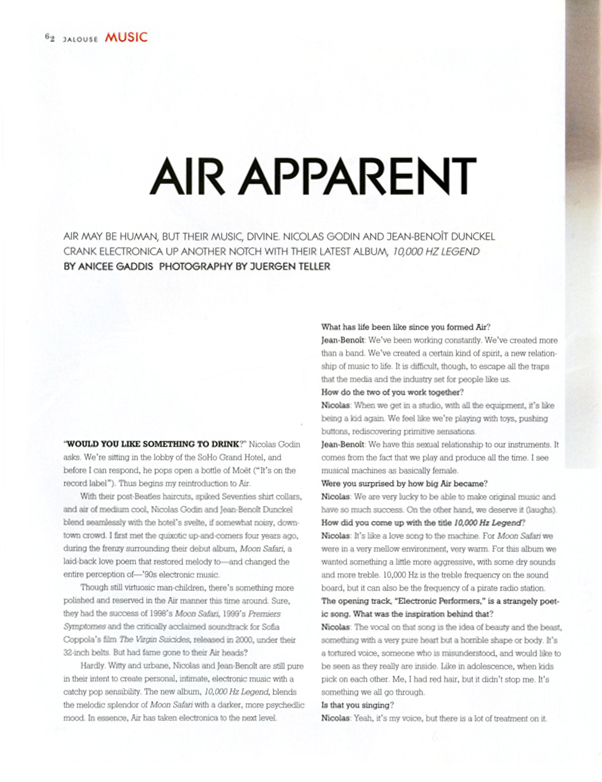 In essence, Air has taken electronica to the next level.